Four years is normally too long to wait for follow-ups to superb records. Cat Power's 1998 album Moon Pix was probably the best of that year, yet here we are in 2003, just getting it's proper successor (2000's The Covers Record shouldn't count, considering it only had one original Cat Power tune on it). Luckily, Chan Marshall has put her heart and soul (along with appearances by Dave Grohl and Eddie Vedder) into You Are Free. She told UNCUT it is "a personal vomiting of whatever my subconscious was dealing with at the time I wrote the songs." Knowing that, YAF gets even more interesting by the minute. YAF is a sad, beautiful album the reveals a lifetime in the span of 14 songs. Marshall's songs are stained with dried tears, able to draw you in through her consistently hypnotic, cracking voice. Her gothic-folk queen style is captured most in her vocals, which struggle to find a level of happiness and comfort, instead sounding quite troubled at times. 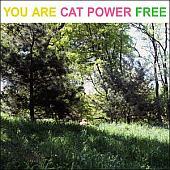 But like PJ Harvey, Cat Power uses a distinct sound to show just how tough the persona is. Without the help of Dirty Three this time around, Marshall has matched the brilliance of her last album's instrumentation (and it has nothing to do with either grunge figurehead). Her guitar playing is a talent unto her own. Her gentle strumming on "Fool" and the near-rock of "Free" marks a style that even the aforementioned Polly Harvey can't compete with. Seeming so precise in every song she writes, Marshall's midas touch has struck again. YAF will easily be one of the best albums of 2003. Expect to see it all over top 10 lists in nine months time.